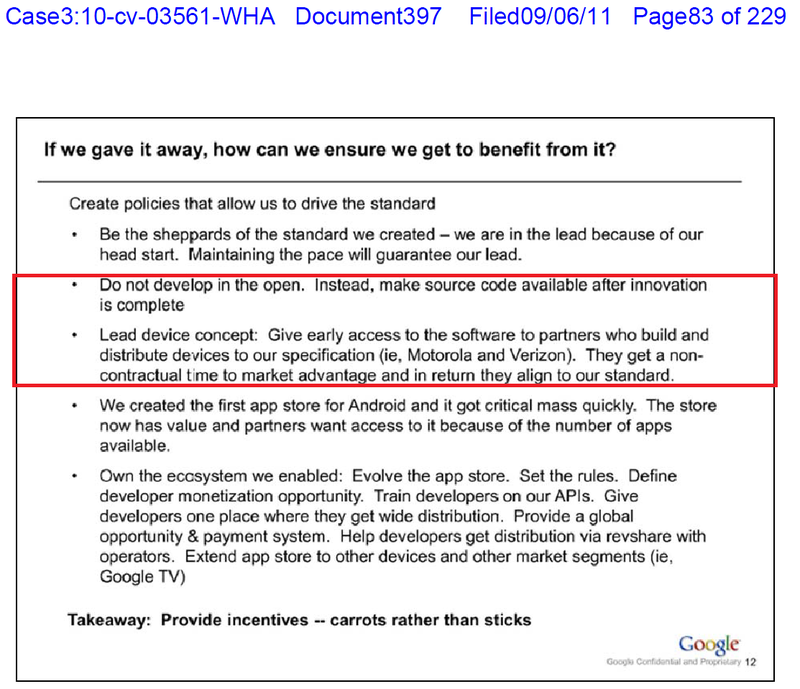 Internal Google document lays out plans to “drive the Android standard”. Motorola to benefit? In a document detailing an internal Google presentation, the company proposes that they give early access to software and hardware partners, specifically Motorola and Verizon, in order to enforce the ‘alignment to [Google’s] standard’, reports Florian Mueller of FOSS Patents. The document is part of a presentation that searches for ways for Google to ensure that it benefits from Android while giving it away for free. The second point is the real kicker as it lays out a plan to give early access to Android builds to certain partners that toe the company line more closely. It’s important to note here that the document is using Motorola and Verizon as examples to outline its point and is not naming them explicitly. But it does bring up thoughts about competition among Android vendors with Google’s recent purchase of Motorola Mobility. That being said, neither of these points are new. We already knew that Google was planning on forcing vendors to sign ‘non-fragmentation’ clauses or wait for the open source code of Android. And Google has worked with certain preferred partners, offering them the earliest builds of Android to launch flagship devices, from the very beginning. You can see an example of this in the Nexus S backstory, where the Android team freely discusses working with Samsung on the device. The bit about ‘not developing in the open’, however, stands in stark contrast to Google’s official policy of ‘open is better’. Because Android is derived from open source projects, Google must submit modified code back to the repository, but it can exercise pressure on OEMs by using the timing of the releases to enforce its policies, which is what it is suggesting here. Ironically, what Google is trying to do here is to fit Android, an inherently open-source project, into a closed model that more closely resembles competitors like Apple or Windows Phone 7. Google wants to be able to exert more control in order to ensure that it ‘benefits’ from Android by having its products installed and its ads displayed on those devices. It’s hard to blame Google for this, as it has put a ton of work into making Android what it is today. Google has a huge stake in its success and has expended a lot of resources that it would like to see paid back in the form of profit from the devices. The issue here is that it started building Android on a platform of ‘openness’ and is now realizing that this doesn’t afford it the control that it needs to make this happen. This document shows that Google is in full brainstorm mode for ways to make Android less open and more profitable.